Dr. Richard Amato is now offering complimentary exams and x-rays to anyone who donates $50 or more to Smile Train, an international charity that is dedicated to fixing cleft palate and cleft lip problems in children. As a compassionate periodontist in Monroe, CT, Dr. Amato is proud to also match all of the donations made. Dr. Richard Amato is showing support for Smile Train this month, by offering complimentary exams and x-rays to anyone who donates to the international charity. The children’s charity offers a sustainable approach to correcting cleft lip and cleft palate in children throughout the world. Dr. Amato is proud to help improve the smiles of children by also matching all charitable donations. According to Smile Train, more than 170,000 children born in developing countries have a cleft lip and/or palate. Dr. Amato is an experienced periodontist in Monroe, CT, and is pleased to show his support for the oral health of children around the world. In an effort to encourage donations to Smile Train, which is a reputable international children’s charity that fixes cleft palate and cleft lip conditions, Dr. Amato is committing to match all donations made to the charity through his practice. He is also inviting patients who donate at least $50 to receive a complimentary exam that includes x-rays and a professional consultation. While cleft lip and palate may seem like primarily cosmetic conditions, they are also functional conditions that can leave children unable to eat, drink, speak and breathe without extreme difficulty. Although the surgery to correct cleft lip and palate is quite simple, families in developing countries are often unable to afford the procedure or may not have access to proper professional care. The cost of the procedure itself is $250. Smile Train not only helps to provide free cleft repair surgery to children in developing countries, but they also make it their mission to train local doctors on cleft repair techniques so that they can help members of their own communities. Children who receive cleft repair surgery are not only able to live more normal lives, but they are also given a critical boost of self-esteem once their appearance is improved. Dr. Amato encourages all patients who would like to learn more about donating to cleft palate surgeries around the world to call his office at 966-892-7692 and ask about Smile Train. As a trusted periodontist in Monroe, CT, Dr. Amato is proud to match donations to this important children’s charity. Dr. Richard Amato is a periodontist and dental implant specialist who provides personalized dental care using the most advanced technology for patients in Monroe, Connecticut. He has placed thousands of dental implants since 1989. 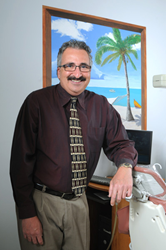 Dr. Amato earned a DDS degree from Stony Brook University. He then completed a full time multi-year specialty residency and received his Certificate of Proficiency in Periodontics from Eastman Dental Center at the University of Rochester. He belongs to the one percent of dentists in the USA currently providing the first FDA-cleared laser procedure for gum disease treatment. Dr. Amato is the first and most experienced provider of LANAP® therapy in Fairfield County, Connecticut as well as the only Periodontist to provide the Pinhole Surgical technique in CT. To learn more about Dr. Amato and his dental services, visit his website at http://www.connecticutperiodontist.com and call (203) 712-0917.